Our itinerary together begins on Santa Cruz Island, the most populous in the archipelago. Here, we first explore the highlands of the islands with their lush vegetation before venturing down to the world-famous Charles Darwin Research Station to meet giant tortoises face to face. After embarking at the end of the day, we sail south to the island of Floreana, where we disembark at Post Office Bay in the morning and Cormorant Point in the afternoon – both full of life and history. We then head west to Española Island, with its remarkable visitor site (a favourite of many visitors): Punta Suárez. Here, we'll wander along the rugged coastline, home to hundreds of marine iguanas, sealions, marine birds, and even albatross (at certain times of year). In the afternoon, Gardner Bay provides a wonderful setting for a combination of beach-time, swimming, snorkelling or exploring aboard the glass-bottom boat. 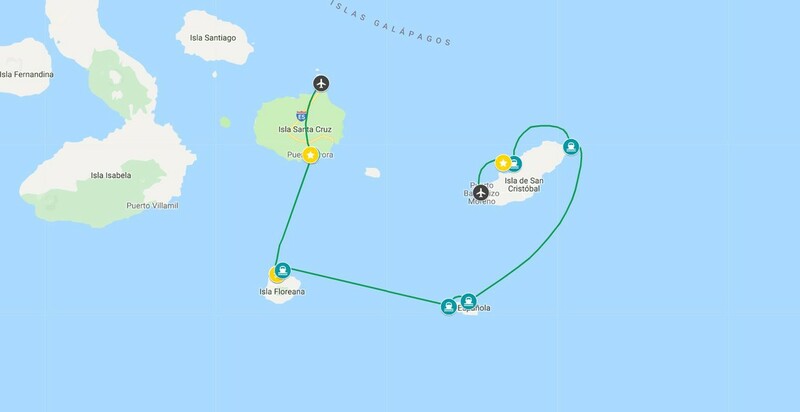 San Cristóbal Island is next, the capital of the Galápagos Province. We explore the northern shores of the island, visiting the fascinating sites of Punta Pitt and Cerro Brujo, taking us back to the young Charles Darwin's visit of 1835. We end our journey at Puerto Baquerizo Moreno. Wherever we sail, whatever we do, all the crew aboard the Isabela II will do our utmost to ensure your Galápagos experience is truly deeply moving and memorable. Please Note: During Peak Season (Dec 24 - Jan 01) a surcharge applies. We arrive at Baltra Airport and transfer to the Itabaca Channel to take a ferry across to Santa Cruz Island. A 30-minute bus ride takes us to a restaurant in the Highlands of Santa Cruz Island to enjoy lunch, and then continue to Puerto Ayora. After driving down from the highlands, we visit the Charles Darwin Research Station and the giant tortoise pens within an impressive giant prickly-pear cactus forest home to many land birds. These are the headquarters of scientific investigation, conservation and the National Park administration. Late afternoon stroll along the main street of Puerto Ayora before embarking on Yacht Isabela II. Expedition plan review, Captain's welcome cocktail and dinner. After breakfast, we land at Post Office Bay to visit the historic barrel that has been serving as a post office in the archipelago for over two centuries. Snorkelling off the beach. Our visit to Punta Cormorant takes in an olivine-crystal beach for an easy walk by a brackish water lagoon where bird species like greater flamingos may be observed. On the other side of the island, we come to a white-sand beach where sea turtles come out at night to nest. We can usually snorkel at "Champion Islet" site, panga ride or ride in our glass-bottom boat. Our morning outing at Punta Suárez provides an exciting walk on lava/boulder terrain to visit its unique sea bird colonies, including the waved albatrosses (April - January), boobies, swallow-tail gulls, and the famous "blowhole". Also, look for red-green-black marine iguanas. Back on board for lunch. In the afternoon, we set down at this beautiful, white coral beach for a short walk to observe the sea lions, mockingbirds, finches or enjoy the beach. There is great snorkelling in this area, or else there's time to kayak, panga ride or ride the glass-bottom boat. In the morning, we land on the eastern tip of the island. The trail that ascends from the beach provides spectacular views of the shoreline and is the only site in the Galápagos where the three species of boobies can be found together, as well as the two frigate species, plus a colony of bachelor sea lions. After the walk, if conditions are favourable, there is a chance to swim, kayak or snorkel from the beach or a panga ride. In the afternoon, following lunch on board, we head out on the pangas along the tuff stone-layered shores that take us to Cerro Brujo's expansive, white coraline beach. Enjoy an easy walk with rewarding birdwatching, including good views of seabirds and shore birds. Also, look out for Galapagos sea lions. These are the same shores that Charles Darwin walked upon back in September 1835. After the walk, there is a chance to swim and enjoy the fabulous beach. The Isabela II cruises offer enriching wildlife encounters whether amid the islands' haunting volcanic landscapes or beneath the waves of its marine reserve, all in the company of passionate, dedicated and expert naturalist guides. The islands' marine life can be appreciated with a snorkel and mask, paddling a kayak or aboard our glass-bottom boat. Our itinerary together begins on Santa Cruz Island, the most populous in the archipelago. Here, we first explore the highlands of the islands with their lush vegetation before venturing down ......click here to read more.